Bring large pot of salted water to a boil for cooking the pasta. In a dry skillet, heat 1/4 cup panko and cook until panko is toasted to a nice golden color, about 3-4 minutes. Set aside. Meanwhile clean and chop parsley: enough to make 1/4 cup. Start the pasta cooking: we like bucatini. Cook enough for 2 people. and stir just enough to heat and break up the sardines a bit, about 2 minutes. When the pasta is almost done, reserve some of the cooking water, drain the pasta and put it in the skillet. Add most of the panko, most of the parsley and some of the reserved cooking water to moisten. Season with salt and pepper. Serve in bowls and garnish with remaining panko and parsley. Balık ekmek, literally “fish-bread,” is what the Turks call these sandwiches. I’ve taken the concept and added some new flavors. 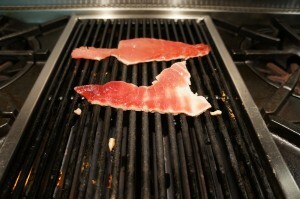 On an oiled griddle, cook an oily fish fillet, like Boston Mackeral or Bluefish, cooking on both sides till done. Meanwhile mix mayonnaise and a spicy sauce like Goya’s Aji Amarillo (3:1 ratio, I’d guess) and spread on toast. Place cooked fish on toast, add sorrel leaves or lettuce. A tomato slice will complete the sandwich, but don’t bother unless it’s perfectly ripe and tasty – you’ll just ruin the whole thing. This recipe will serve 6-8 people. Prepare Tomato-Fennel Sauce in advance. You will need one piece of boneless (skin-on) Striped Bass per serving. Cut up 2 fennel bulbs: trim root end slightly, cut off stems. With root sitting on cutting board, cut vertically to split the bulb in two. With cut side of bulb facing the cutting board, make 1/2-inch-thick slices by cutting in the same direction the plant grows. Heat oil in a large, heavy skillet. When very hot, add a layer of fennel to pan and let brown on both sides. Remove from pan and work in batches until done. Put fennel in another skillet large enough to hold it all. All 1 to 1–1/2 cups of chicken stock. Cover skillet with lid. When it’s time to cook dinner, preheat oven to 400 F and warm up the sauce. Heat the covered skillet containing the fennel to a simmer; let braise until tender but not overcooked while you proceed to cook the fish. Oil and heat a heavy oven-proof skillet or griddle on a high heat. When oil is smoking, place fish in pan, skin side down. 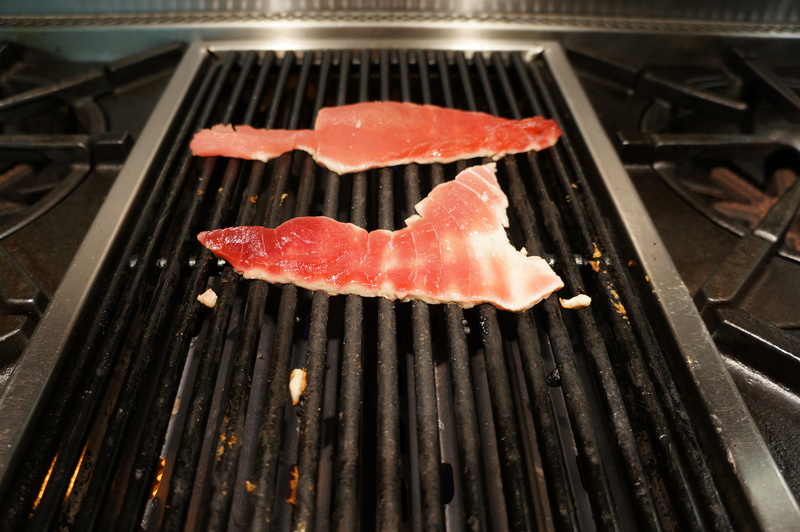 Depending on thickness of fillets, cook 3-5 minutes. Transfer skillet to oven until fish is done cooking, probably another 3-5 minutes. To serve, ladle 1/2 cup sauce into bottom of bowl. Add a layer of braised fennel. Place fish on top of fennel and garnish with chopped parsley or basil. Serve with bread to mop up the sauce. Purchase a very fresh monkfish liver; I bought one that weighed about a half-pound. Trim any pieces of membrane or visible blood vessels from it. Place it on a plate and arrange a steamer large enough to hold the plate. Steam the liver on the plate for about 20 minutes. A larger one will probably take a bit longer, but since the timing has a lot to do with the thickness, I wouldn’t suspect the time is linear in relationship to the weight. When it’s done cooking, place the liver on a cutting board and let it sit for a minute, then cut in to 1/4-inch slices. Serve at room temperature with finely grated daikon and ponzu sauce. A half-pound liver makes about 4-6 servings, depending on how much of this rich food you like to eat. The daikon goes very well with the liver, but go easy on the ponzu sauce… it can overwhelm the flavor of the liver. Leftovers can be refrigerated, but not for long. I have read that it also can be frozen, but haven’t tried that. Don't bother with this unless you have amazing tomatoes. Coupled with grilled thin layers and a spicy-smoky citrus dressing, this is one of our summer favorites. 1–1/4 pound tuna, cut into 1/4-inch slices. and dry them thoroughly. Roughly chop them and set aside. If you can convince your fish vendor to cut 1/4-inch thick slices, do it. If not, buy a thick tuna steak; freeze it for 8 minutes and slice it yourself with a very sharp knife with a long thin blade. You will need 3 or 4 slices of tuna per serving. Cut the tomatoes into &diamondsuit;ATTNthin slices. Tear away any tough or unattractive areas of the lettuce leaves. Arrange all the ingredients so you will have ready access to them as the assembly will proceed rather quickly. The piece of tuna at the front is almost over-cooked. 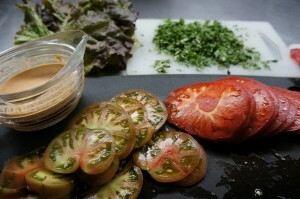 On each plate, place a lettuce leaf, a slice of tomato and splash it with 2-3 tsp of salad dressing. 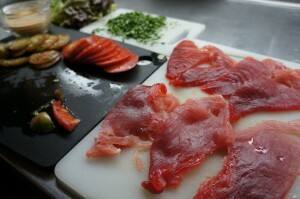 Brush the tuna slices with a little oil. Put a slice or two of tuna on the hot grill and &diamondsuit;ATTNwatch it like a hawk. It needs to cook 15 seconds on each side, if that. Place the tuna on the tomato slice. Again, layer lettuce, tomato, dressing and the second piece of tuna. 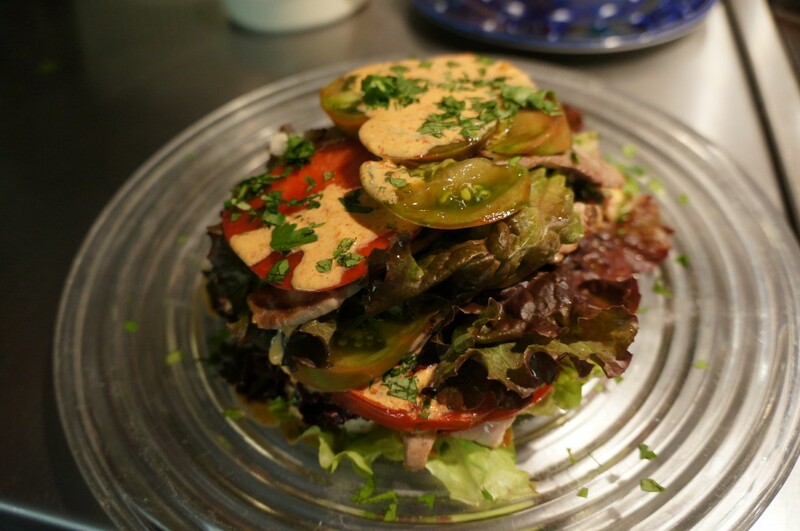 Continue working to make a third layer and end with a final lettuce leaf, tomato and a little more dressing. Sprinkle the reserved cilantro leaves over the top.